Plant City softball ace Ashley Blessin leads the state in batters struck out through the team’s 10 games. The Plant City Raiders have a clear defensive advantage over most teams on their schedule: there’s rarely anything to worry about when the ace is on the mound. Ashley Blessin’s got a reputation to uphold and is doing so as well as anybody in Raider Nation could have hoped. The senior strikeout artist has been as adept in 2019 as ever at making batters miss, as she entered the spring break period with a school record 139 strikeouts through 10 games. That’s an average of roughly 2.3 whiffs or looks per inning through 61.2 innings pitched and 214 batters faced. To put those figures into perspective through MaxPreps.com, her 139 strikeouts put her at tops overall in the state in that stat. No other pitcher in any other district, region or class in Florida trails her by fewer than 24 strikeouts — Gainesville High’s Alissa Humphrey has 115 strikeouts through eight games played and is also averaging 2.3 strikeouts per inning. On a national level, Blessin’s strikeout total is good for 14th overall as of press time. Though she’s using spring break as an opportunity to get a little more rest than usual, Blessin is still hard at work. She’s become a dedicated CrossFitter and spends her mornings in the gym to keep her stamina up. She’s also always studying film for ways to get one up on every batter in the district. “In the district the hitters see me a lot, so you need to develop better pitches and change your approach just so they’re not seeing the same look every single time,” she said. Blessin sports a 0.34 earned run average. Opponents are only batting .078 against her and reaching base against her just over 10 percent of the time. Five of her wins have been shutouts. 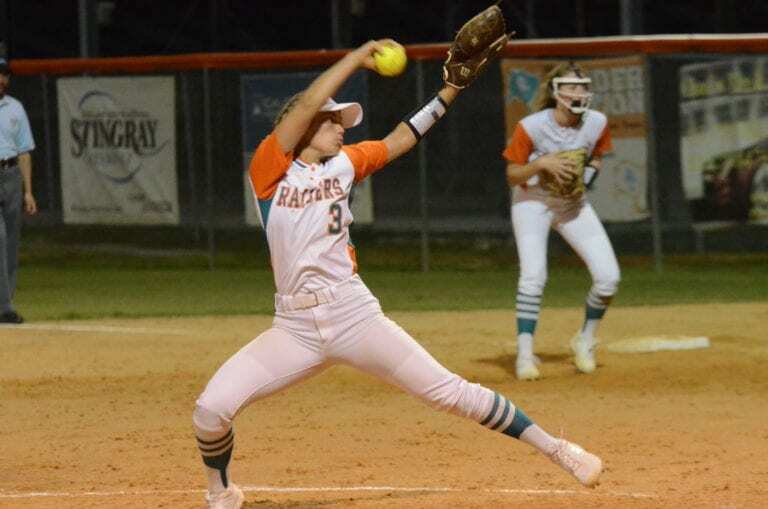 At the rate she’s going, there’s a very good chance she’ll walk away from high school softball this spring with yet another Hillsborough County Pitcher of the Year award — which would be her fourth — to her name. Some of her goals for the season are to four-peat with that award, win districts and get back to states for the first time since her sophomore year. Most recently, Blessin struck out 15 of 24 Strawberry Crest batters in the Raiders’ 6-0 win over Strawberry Crest on March 14. The Chargers were able to pick up three hits against her and two batters were hit by pitches, but Blessin and the PCHS defense were able to escape all of the jams. The team starts four seniors, one junior and sophomores for the rest of the spots. Though this sophomore-heavy Raiders team has the most wins of any team in Class 8A-District 6, its 2-1 loss to Durant in nine innings on March 7 puts PCHS in fourth place in the district standings. In addition to a Durant team that’s been playing well, Plant City will also have to contend against a pair of very good, currently undefeated (each 6-0) teams in Bloomingdale and Riverview that currently top the standings in 8A-6 play. The Raiders will be put to the test immediately after returning from spring break next week: Riverview comes to 1 Raider Place at 7 p.m. March 26 and Bloomingdale will play at Plant City at 7 p.m. March 29. The road ahead won’t be easy for Plant City, but the Raiders can take some comfort in knowing they’ve got one of the best weapons in the nation on the pitcher’s mound.